A young boy riding a hand cycle rides past the camera smiling. 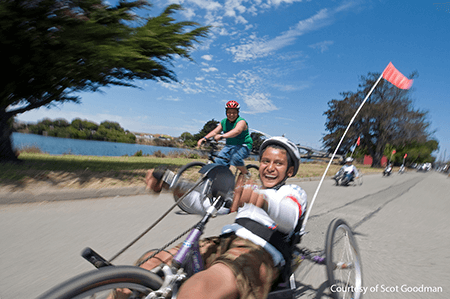 BORP’s Adaptive Cycling Center in Berkeley has the country’s largest and most diverse collection of cycles for use by people with physical disabilities. BORP offers orientation and training to new riders, independent use of our cycles, and group rides. For general information about BORP’s Cycling Program, see below. If you have any questions or are interested in becoming a volunteer, please email cycling@borp.org. BORP’s Adaptive Cycling Center Hours is open WEATHER PERMITTING. Schedule: Tuesdays & Thursdays from 1:00pm – 7:00pm; and Saturdays from 9:00am – 3:00pm. The Cycling Center is closed during the winter (Dec-Feb). 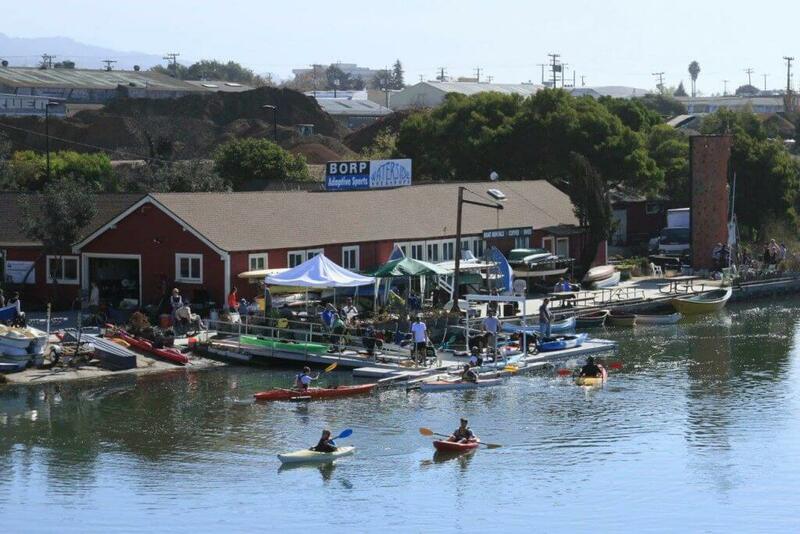 Please call (510) 848-2930 to confirm that the Cycling Center is open or to make a reservation. Getting there: The Cycling Center is located at 80 Bolivar Dr, Berkeley, CA 94710. Click here for directions (Link opens a Google Map). Once you have been trained you can use our cycles and ride independently or with friends on over 40 miles of Bike Trails right from our Center. Train three times a week if you want! Youth under 18 must ride with a parent or guardian, or on one of our youth group rides. If you’re new to BORP cycling please call or email before coming. Be ready to roll at 10:00 am on your bike or a BORP bike for a social training ride on the Bay Trail. Group Youth Rides are escorted by trained BORP volunteers and parents. 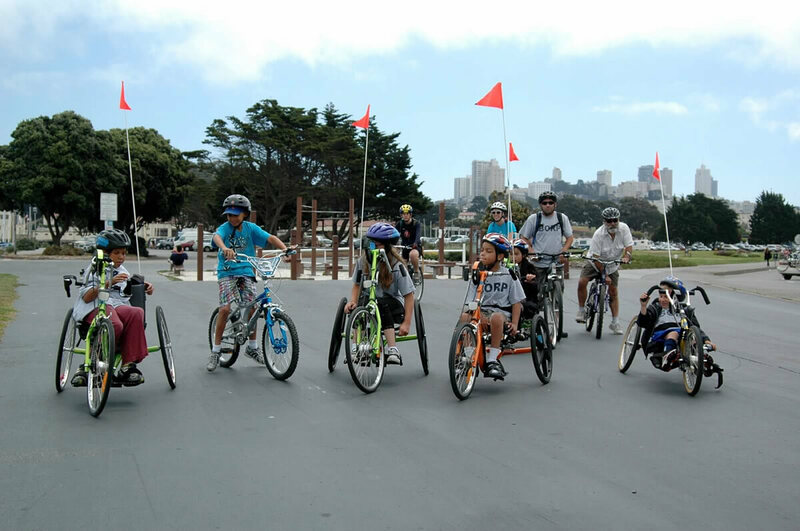 Youth riders on group rides must be enrolled in BORP’s programs, and be willing and able to follow directions independently. Youth group rides are social and casual exercise rides. Youth Group Rides meet at 10:00 am on Saturdays. Riders should be ready to roll by 10:30 am. Youth riders accompanied by parents or guardians with are always welcome anytime the center is open. Youth riders must contact BORP in advance of riding on a group ride. Please email cycling@borp.org or call the Cycling Program at (510) 848-2930. Check out our Events Calendar for scheduled away rides. BORP has trained tandem pilots and tandem bikes for riders who are blind or have visual impairments. We have monthly group rides and opportunities for individual training. Contact us for details. Needed: Strong Cyclists to Ride Tandems with Blind Athletes. Program fees help us cover the cost of equipment and repairs. Scholarships are available but we hope you agree that our fees are reasonable and still far below the cost of any other bike rental program or gym membership. Youth under 18 and first timers: Free! Great Volunteers and Interns always needed! Our cycling program exists because of the dedication of BORP volunteers and interns. If you are enthusiastic about outdoor exercise, cycling, and adpative sports – we need you! We especially need strong cyclists interested in riding Tandems with some of our riders. Please contact us by phone or email to learn more at: cycling@borp.org or at (510) 848-2930. Oakland’s Cole School gets moving at BORP!